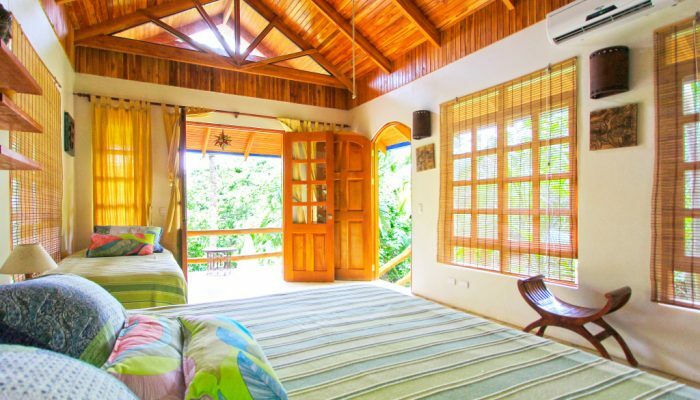 Each of our four Costa Rica Bungalows come equipped with A/C, a ceiling fan, hot water, gorgeous breezy verandas and pillow top mattress’. In each room, we also provide, a digital lap top sized room safe, rain-can shower heads, beautiful furnishings, organic soap and aromatherapy candles. Other Amenities include our rich Costa Rican coffee service, daily house keeping, cool sparkling pool, security guard, open air rancho kitchen, wireless internet access, and access to phone. Most impressive, we are just steps away from one of Forbe’s “Top ten most breathtaking beaches in the world”. We have become known for our stellar customer service. Our managers, have years of experience in hotel management and are dedicated to making sure all of your needs are met. They all speak perfect English and Spanish and emit the most beautiful energy and Pura Vida vibe. Our staff are more than happy to help accommodate arranging all your holiday wishes while you are our guests. We offer private or group surf lessons, public and private yoga, massages, spa services, quad and bike rental, zip line canopy tours, horseback riding, sport fishing, a trip to Cabo Blanco Nature reserve or the Montezuma waterfalls, restaurant recommendations and reservations, booking tours, taxis, and more….We work together to ensure your vacation is effortless and all about you, your comfort and enjoyment! In our inviting, cozy outdoor rancho kitchen and communal area, infamous delicious coffee is always brewing and you are welcome to utilize our fully equipped kitchen. Perhaps you will choose a book from our book exchange library or enjoy the company of an eclectic mix of interesting souls…our other guests. You might find yourself playing backgammon, cards or a relaxing game of chess. Bring your laptop if you would like to keep in touch with family and friends using our free wireless internet. 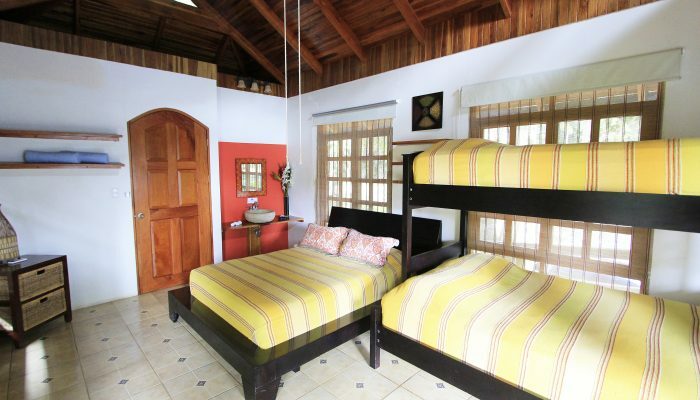 All Bungalows in our hotel can accommodate up to 4 people. Click above on each bungalow for specifics on bed arrangements. An extra single bed can be ordered. Every bungalow is built high off the ground, allowing for amazing sea breezes and the sounds of the ocean to lull you to sleep at night. We provide daily house keeping and organic soap. In keeping with the calming blue theme, mosaic showers have room for two and the rain can shower head will soothe your muscles with hot water after a day of surf, yoga or hiking! Large comfortable chairs on the balcony will provide you with tree top views to see the monkeys, butterflies, fireflys and birds. 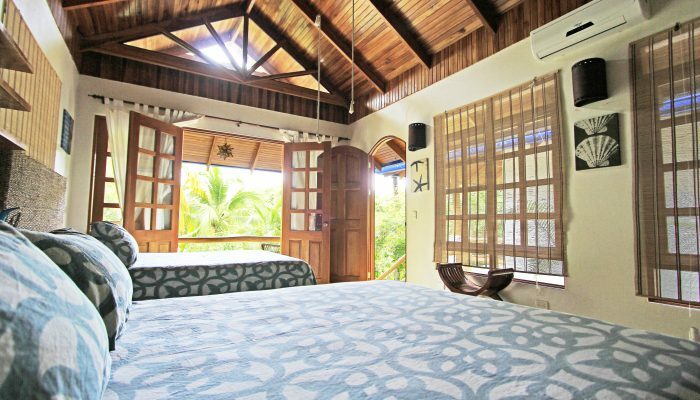 Each Bungalow features gorgeous, thoughtfully chosen decor, lovely balconies that offer tree top views, ocean breezes and the exotic sounds of the jungle. To make hanging out on the veranda an ultra relaxing experience, We chose stylish and comfortable furnishings. All surf bungalows feature lush pillow top mattress’ that will have you resting deeply. 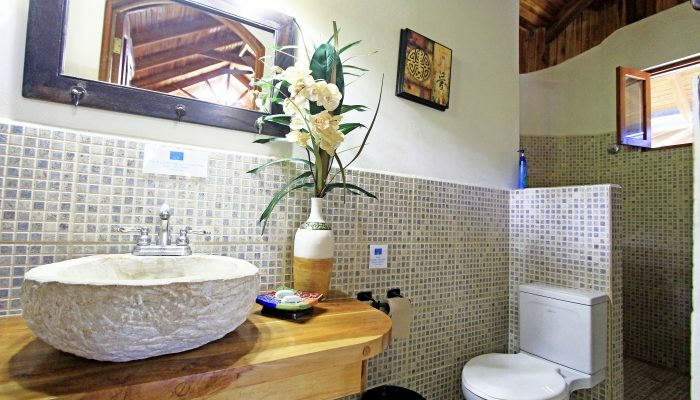 Our private bathrooms feature hand carved stone sinks with organic soaps. The large, all tile, hot water showers soak you with a rain-can shower heads.